"If he comes over - and, as I said, he wouldn't want the ground to get too soft, though he has won on it - then I think he could be hard to kick out of the frame, so I will take my chances at 25/1 three places." To say we have got a weekend's horseracing to savour would be selling it short. At Sandown on Saturday, we have the Betfair Tingle Creek, as well as the Grade 1 Henry VIII Novices' Chase, while over at Aintree we have at least three excellent races to get stuck into, including the Becher and Grand Sefton. On Sunday, we have a potentially brilliant line-up in the John Durkan Memorial at Punchestown, the Hilly Way at Cork, and the Grade 2 Peterborough Chase at Huntingdon. And, on Tuesday afternoon, we got the latest entries for the King George at Kempton on Boxing Day, where I am pleased to say that my long-term, big-price, fancy Disko remains in the field. More of him nearer the time, hopefully. A veritable punting array of riches, so I will stop waffling and crack on, starting, and ending as it happens, with the big one at Sandown, this weekend, where I am not sure if the Betfair Sportsbook odds-compilers will have been pleased to see Douvan among the five-day entries and trading at [1.9] at the time of writing! In terms of a spectacle and depth to the race, then of course Douvan's presence is a massive plus for the prize and the sponsors. The problem for the odds-compilers is that they stuck their head above the parapet a couple of weeks ago, and offered the horse at 4/1, fully two points bigger than anywhere else in the marketplace. Oops. So, if you took those inflated and generous odds (he said, with no little hindsight), you will be on very good terms with yourself, from a trading perspective at the very least. The last time we saw the horse he was a very disappointing seventh in the Champion Chase (when he apparently was found to have a stress fracture of the pelvis), but the vibes emanating from the Willie Mullins camp are very positive indeed about his current well-being and levels of work. And a reproduction of some of his better efforts - notably his serial dismissals of the Gold Cup winner Sizing John - will surely make him very hard to beat. Mind you, he has never raced around here and he will have be near his best to see off the challenge of the race-fit Fox Norton, who was very impressive on his Cheltenham return and who was very assured at the back-end of last season, notably in his defeat of Un De Sceaux at Punchestown, though his Aintree win was no less shabby. That pair dominate the market and rightly so, for all the strong-travelling Politologue could be a sight to behold around here and Special Tiara always comes on a ton for his first outing of the season. If you are on Douvan at 4/1, then happy days, but I was initially going to wait until seeing what the final field looks like on Thursday before having a bet. 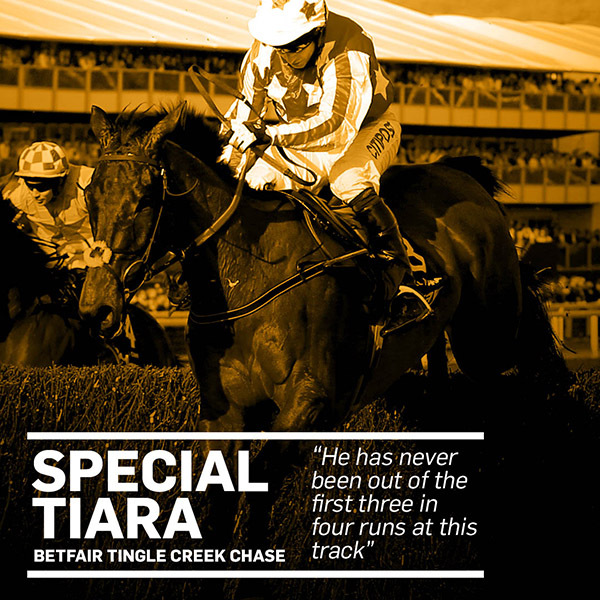 That said, the 25/1 each-way, three places, with the Betfair Sportsbook - he is bigger, win-only, on the Exchange - about Special Tiara does interest me. The more I looked at the price, the more "wrong" it looked. The problem, as ever, is that I don't know if he is an intended runner, and the possibility of soft ground (though the forecast this week isn't too bad, and good to soft will be fine) may prompt connections to swerve the challenge, but I will take my chances at the price. And history says he finished an unlucky second to Sire De Grugy in this race two years ago - he got broadsided at the last - and he has never been out of the first three in four runs at this track, so hopefully he will get the green light to run. I have already mentioned how much he always needs his first run of the season so, with that in mind I think you had to be very encouraged by his third to Fox Norton in the Shloer at Cheltenham last month. It could well be that connections will opt to wait for the Desert Orchid at Kempton on December 27th instead of coming here - he won that race after running in the Shloer last season - but I am happy to give it a whirl. As ever, I will be backing my selection, so if you do your money in cold blood then you can be assured I have done as well. That won't be much compensation, admittedly! 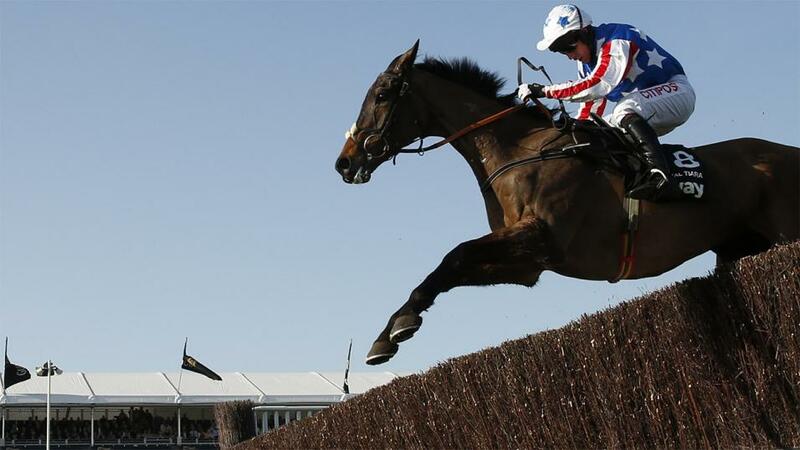 Don't forget, this is a horse who beat Sprinter Sacre by six lengths in the Celebration Chase here in 2015 and who beat the second-favourite Fox Norton (who improved subsequently, admittedly) by a head in the Champion Chase in March. If he comes over - and, as I said, he wouldn't want the ground to get too soft, though he has won on it - then I think he could be hard to kick out of the frame, so I will take my chances at 25/1 three places. This race has the potential to cut up a fair amount, too, so those three places could prove very appealing come Saturday afternoon. Charbel is also in the Peterborough on Sunday (as is San Benedeto), while Un De Sceaux is in the John Durkan at Punchestown and the Hilly Way at Cork on Sunday (as is Top Gamble, and Douvan as well), and I am not too bothered about the rest, with the exception of Sir Valentino, who bounced back to win an Ascot handicap off 159 last time. Though that wasn't a strong race at all, for the money. The fourth favourite Ar Mad was pulled up at Exeter on his return, and I think that underlines just what a good each-way punt Special Tiara is. So come on Henry - and he also has the far inferior Ordinary World in the race - get him on the boat on Friday. The 25/1 each-way looks plain wrong.